The knitters were often known as the terrible knitters of Dent and like me, they knitted during church services (Hooray!) but unlike me they knitted very fast. 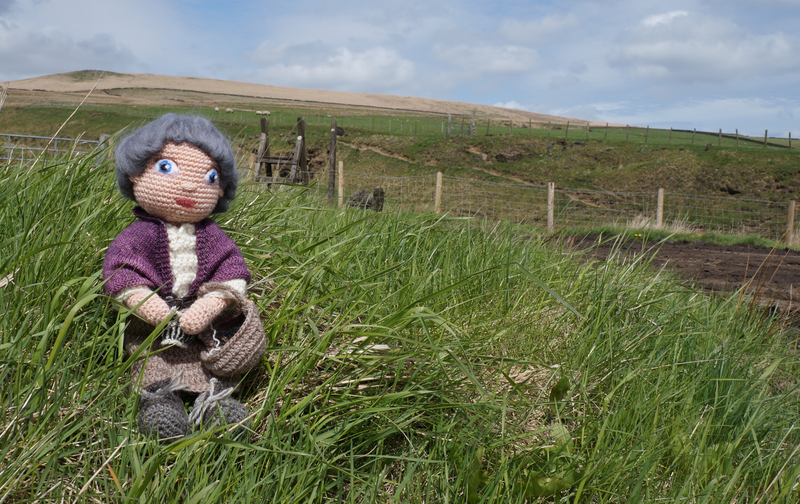 One of the many items knitted in Dent are the fine gloves, knitted similarly to Sanquhar gloves in a fair isle style pattern. So, my doll had to have her own knitting and is currently up to the fingers of her second glove. The first one (which took me 6 hours knitted on five 1.5mm double pointed needles) is in her basket along with her balls of wool. She has a hand knitted plain shawl and a hand carved knitting sheath tucked into her leather belt. I think the hardest part of making this doll was remembering to stop making the second glove so Betty could hold the knitting.